NOVUS can be used in any applications where H.264 video encoding is required. NOVUS is a highly reliable H264 hardware encoder that can be used by traditional broadcasters as well as professional end users alike. Broadcasters can encode incoming SDI signals into H264 video for output to DVB-ASI or UDP/RTP IP. While end user professionals can utilize the many supported video streaming protocols for real time live video streaming. Supported live streaming protocols include RTMP, HTTP Direct Streaming, and HLS. NOVUS has been tested to work with Akamai, Facebook, YouTube, Livestream, UStream, SnappyTV, DaCast and many other live streaming CDN’s. 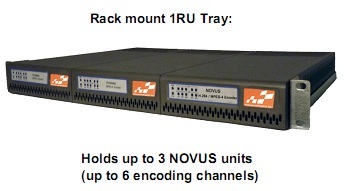 The NOVUS is a feature-rich high performance broadcast single-channel or dual-channel H.264 MPEG-4 AVC HD/SD video encoder that delivers up to 2 individual or simulcast HD/SD channels in a standalone desktop chassis. The dual-channel model of NOVUS has built-in multiplexer and can output 2 individual or one multiplexed ASI and IP streams. If desired, up to 3 units can be installed in a 1RU rack mount tray, providing 6-channel H.264 HD/ SD encoding. The NOVUS has been designed to meet the demanding requirements of the IPTV, Telco, professional broadcast, enterprise video delivery, and streaming video markets. NOVUS encoder is equipped with the latest advances in video compression technology to deliver unsurpassed video quality at ultra low bitrates. Simultaneous support of DVB-ASI, broadcast video over IP, RTMP and HTTP Live Streaming allows content to be freely distributed over virtually any video network. Single or Dual-Channel models: NOVUS-1E, NOVUS-2E. Audio Inputs: unbalanced analog stereo L/R, SDI embedded digital stereo, balanced XLR (on request). Optional support for up to 4 stereo pairs. Outputs: 2 ASI ports and 2 Ethernet ports, supporting 100 Mb/s and 1 Gb/s operation. Replication: each encoded stream can be replicated on both ASI ports and 4 times on each Ethernet port. Support for UDP/RTP on Ethernet. Support for Direct HTTP streaming and HTTP Live Streaming (HLS). Support for SMPTE 2022 FEC on Ethernet (optional). AFD extraction and insertion support. Audio Encoding support: MPEG-1 Layer II and AAC-LC (optional). 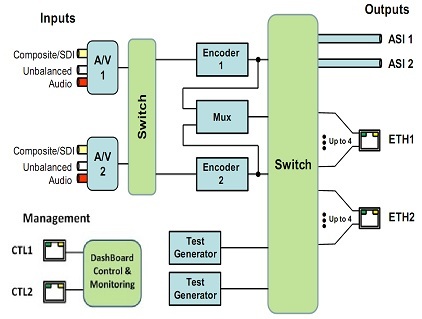 Support for pre-compressed Dolby AC-3 pass-through embedded in SDI inputs. Built-in multiplexer for Dual-Channel model: each output can be configured to carry either encoder as a Single Program Transport Stream (SPTS), or both encoders as a Multi Program Transport Stream (MPTS). Two internal test packet generators (which can be used to generate ASI or IP test streams).